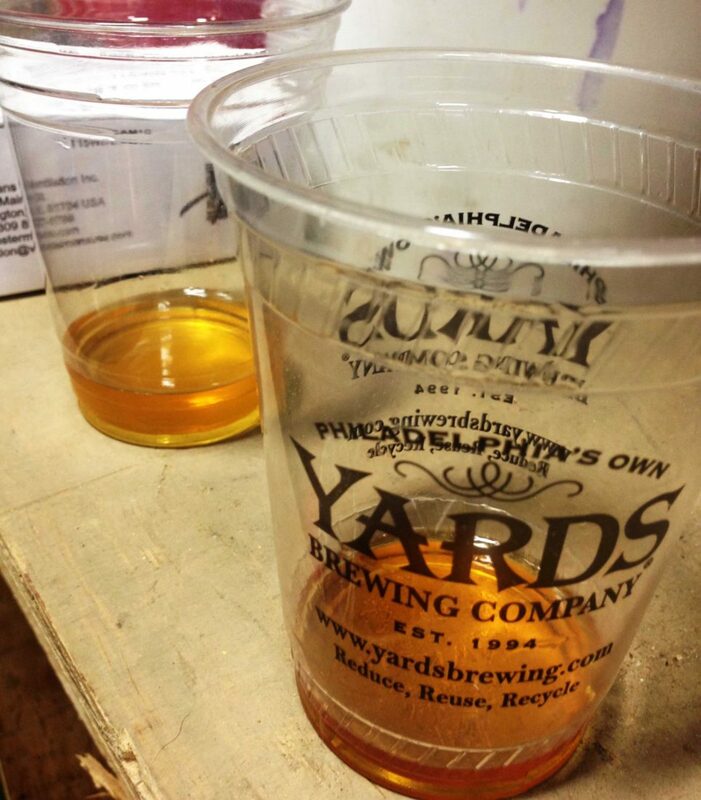 This post is part of a series (of indefinite length) about how I am working with the Yards Brewing Company and brewer Franklin Winslow to help create wild and barrel aged beers at the brewery. An earlier post can be found here. The goal of the project is to get Yards established in the “wild beer” world, and make some really interesting, repeatable sour beers. While the brewery has been working with spirit barrels for some time, “wild ales” – from soured mash to finished beers inoculated with wild yeast are new to Yards. Brewer Franklin Winslow was nice enough to allow me to be involved from the start of the project – helping out where I can, and assisting in the formation of the program and the beers. Since Yards started the program in January we have made real progress in building up the “infrastructure” for a sustainable wild beer program. The brewery has acquired several barrels and other Yards brewers have joined in with us on the process. We started with one sour mash Thomas Jefferson Ale from a bourbon barrel and since then things have expanded considerably. One of the tasks I did recently was help to empty out a bourbon barrel, clean it out (with ozone) and then prepare it for a new batch of beer. I learned quickly how heavy a barrel sodden with beer – even when empty – can be. 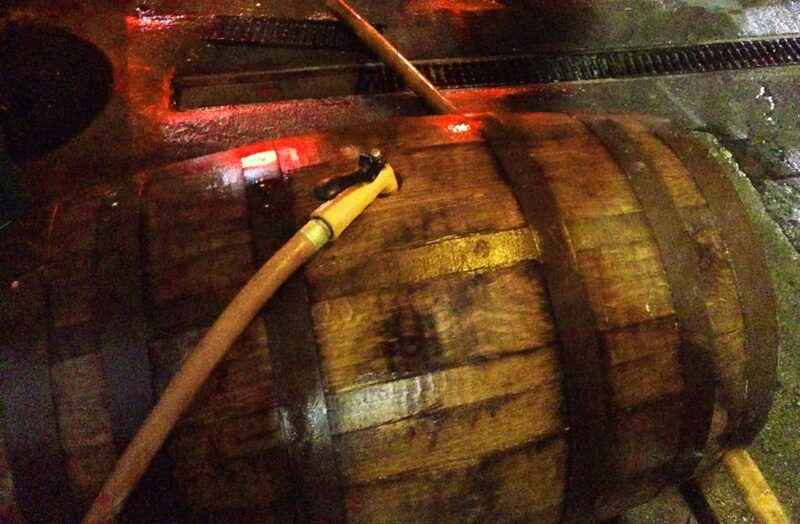 It’s even worse when slippery after cleaning, I ALMOST dropped it, but we made it to the barrel rack. 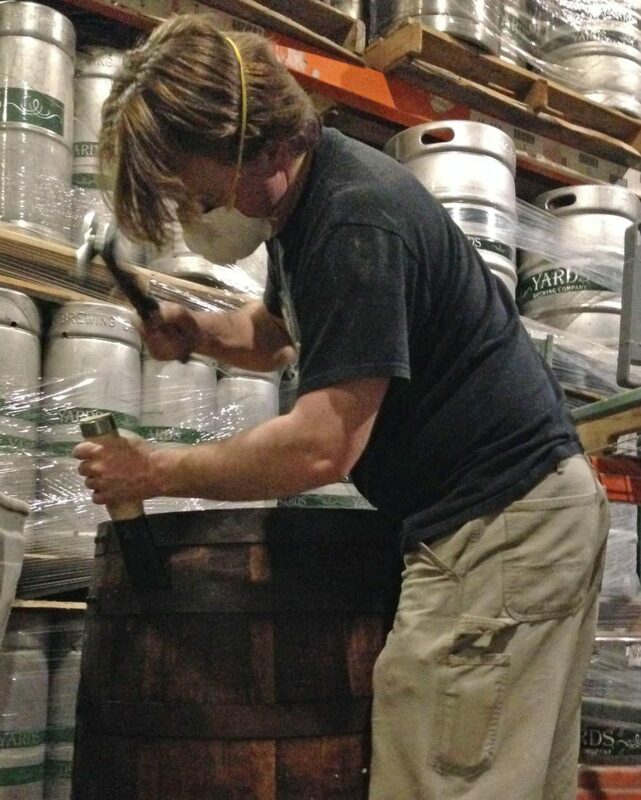 Using some cooperage equipment, Franklin was able to tighten things up for the next fill. Even getting a sample of the beer in and out of the barrels is an adventure – requiring very complete sanitation to keep the wild yeast in check – and specialized equipment to pull out the bungs. We now have some “Dad’s Hat” “port aged rye” barrels in the mix, including one filled with Gran Cru. That one gave off some vanilla notes as was expected, but the essence of honey and fruitiness was a bonus. That beer is ready to be racked and packaged. I can’t wait to have a glass with a bit of carbonation. We have a couple of Merlot barrels now, one with Yards Saison and a Brett inoculation – and another with Brawler with a Lambic strain of yeast. Both of these were dosed with the live yeast about 6 months ago – and the Saison already has that Belgian funky ester clearly present in the flavor profile. The Brawler on the other hand barely shows any impression of the lambic – it will need another three or more months or more to really take over. At one point the brewers created a special batch of “Flanders Red” style beer just for barrel aging. This distinct, ancient Belgian style is typically high in acid and intensely sour – dosed with at least one or two strains of wild yeast. The Yards version has not yet taken on that profile, as in Belgium these beers age in oak barrels for several years to generate the acid flavor. 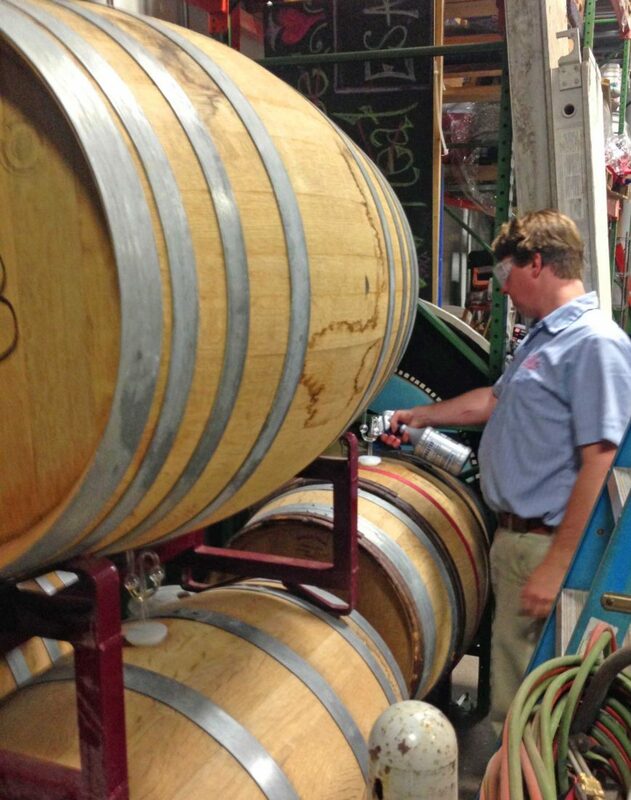 Two wine barrels are filled with the Flanders – using two different kinds of belgian yeast. We all agreed that these beers were “going the right direction” though tasted more “goaty” than typical Flanders acidic flavors. It takes time. But, soon we will have a good portfolio of sour beers, this will allow us to move to the next step and blend off some of the sour beer with other Yards brews – and create unusual, refreshing soured Yards – flavors new to Philadelphia’s beer appreciators. Some of these will hopefully appear at the Yards tasting room sometime next year (if not sooner). Next new “wild” beer to get started is Love Stout in a bourbon barrel with a brett strain added for second fermentation. That is going to be delicious – stay tuned as the Spontaneous Generation Project rolls on.